What is Engineered Siding? Usually engineered siding is defined as siding made from some type of glue or resin and scrap material, mostly wood or the bi-products of milling wood such as sawdust or wood chips. Although that’s a pretty widely accepted definition in the siding industry, most homeowners looking for an engineered siding are simply looking for something that will give them the look and feel of real wood without the maintenance of real wood. To learn more about Everlast Composite Siding, download our free comparison here. Dozens of versions of engineered siding have been released by various companies and under various brand names over the past 40 years or so. You might recognize such names as Masonite siding, Georgia Pacific, Louisiana-Pacific Siding, OSB Siding, etc. 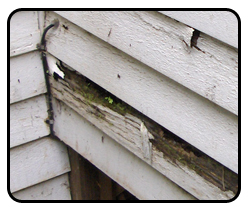 According to oldhouseweb.com, Engineered wood siding “proved popular with builders, but defects became commonplace, especially in the hot, humid climate of the Southeastern U.S. or the extremely wet climate of the Pacific Northwest.” Generally speaking engineered wood siding does not have a long-standing reputation as being the most reliable product. If your goal is to find a siding product that looks like real wood but doesn’t require as much maintenance and holds up well in all environments, Everlast Composite Siding may be an excellent choice. If you live in Massachusetts, Rhode Island, Southern New Hampshire, or Northern Connecticut you may request an estimate here.